Meet your neighbor and Illini West Senior Lauren Rose White. Lauren lives on the Basco blacktop south of Carthage. She was born on March 11, 1996 in Peoria and raised in the Carthage area. She is the daughter of Tom and Jenny White of Carthage. Tom is a field service technician for Digital Copy Systems and Jenny is a language arts teacher for Carthage Middle School. Lauren's brother, Kevin, is 13 and an eighth grader at Carthage Middle School. She is the granddaughter of Jim and Janice Rosenboom, Chet and Myrtle White and great-granddaughter of Maxine Johnson all of Carthage and great-granddaughter of Margaret Rosenboom of Hamilton. Lauren is President of National Honor Society, President of International Club, Vice President of Student Council, Captain of the Quiz Bowl team, and Captain of the Cross Country team. She has been named an Illinois State Scholar, is in the National Honor Society, High Honor Roll, and has been Charger of the Month. She has been honored for All Conference Quiz Bowl, and All Conference Cross Country. 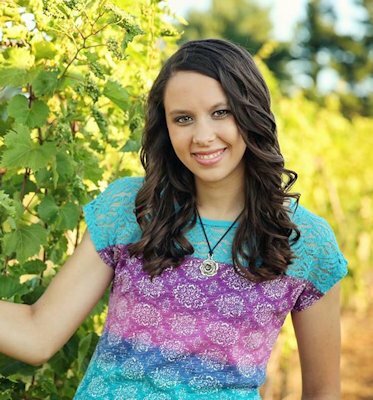 Lauren is a member of the First United Methodist Church of Carthage. Her favorite high school memory was traveling to Paris, France and Madrid, Spain with the Illini West International Club. She will graduate in May as a member of the Illini West Class of 2014. After graduation, she plans to attend Illinois College in Jacksonville, and major in Biology with a focus in cytotechnology (which is when lab technicians study cells for evidence of diseases, such as cancer). She plans to minor in French. In her spare time, Lauren loves reading, baking, playing the flute, and running.